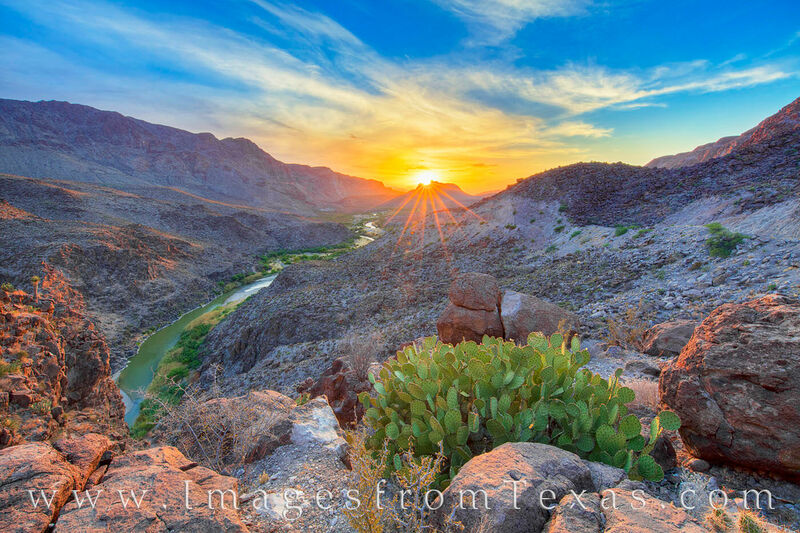 With the sun shining its last rays of daylight over the Rio Grande as it winds its way east, the rugged terrain of Big Bend State Park in west Texas displays the unique beauty for which it is known. This area where this photograph was taken is called the Big Hill, and after a scramble up a rocky cliff, views can be found in all directions. Be careful, though. It is a long way down and those rocks are sharp and unforgiving, as are the many cacti and yucca that call these cliffs home. FM 170 runs 49 miles between Presidio and Lajitas, and this is one of several stops that offer amazing vistas of this area. To the left (south) is Mexico; to the right (north) is the Lone Star state. This was nearly a perfect evening for taking in these rugged mountains, and I was fortunate to be there for a few colorful moments.